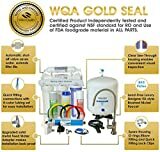 What is the pH of Reverse Osmosis Water? 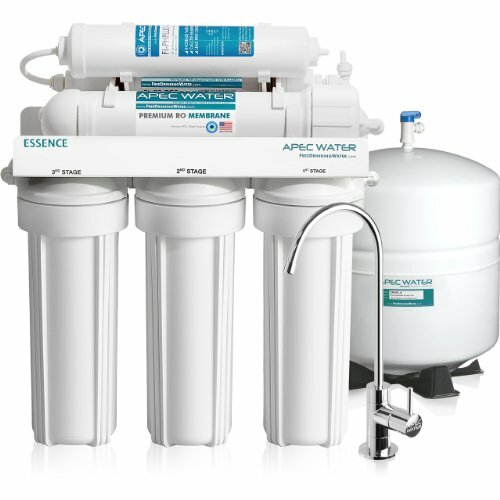 Reverse Osmosis water tends to be slightly acidic with a pH of 5-6. This is because the semi-permeable membrane successfully filters out contaminants, but is not able to filter carbon dioxide – which can also dissolve in the water after it passes through the filter. The presence of dissolved carbon dioxide makes the water slightly acidic. Mineral water is not quite as acidic because there are other compounds in it that balance the pH out. Because RO water is so close to distilled water, carbon dioxide can dissolve in it very easily. pH stands for potenz hydrogen, or the amount of free H+ ions present in the solution. Water has a dissociative property. While we’re familiar with the chemical formula of water being H2O, water is actually an equal combination of H+ and OH– ions. If the number of H+ and OH– ions remains equal, the pH of the solution will be 7, or neutral. The moment H+, the pH starts ticking down, indicating that the solution is getting acidic. 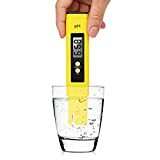 If the concentration of OH– increases, the pH starts ticking up, indicating that the solution is getting more alkaline. A common acid is hydrochloric acid, or HCl. HCl is actually H+ and CL–, so the increased H+ ions in the solution(in addition to the ones already in the water) will push the pH down. When carbon dioxide dissolves in water, an interesting process takes place. Instead of adding extra H+ ions, it actually removes OH– ions by combining with the OH– ions to form HCO3–. This is why the pH slightly drops. You can measure pH of a solution using a pH meter. These are simple devices that have a small electrode you dip in the solution and the screen will show you a reading. These devices are the most accurate way to measure pH – don’t waste your time with pH strips as you’ll only get an approximation with those. Still, the pH drops only a minute amount and you won’t even notice the taste. Highly acidic water can be corrosive over a long period of time and can slowly eat away at the pipes and plumbing in your house. Most natural waters in the USA have a pH between 6.5 to 8.5. This much fluctuation is completely normal. The acid raid that you hear about on the news as corroding buildings and statues is actually much more acidic, with a pH closer to 4. You may think that you need to avoid acidic water like the plague, but that’s just not the case – we regularly consume acidic foods and beverages. Are you a fan of sour foods? I’ve got news for you: all sour foods are acidic! As you can see, we are accustomed to drinking a wide range of pH beverages and our bodies do a fantastic job of balancing out the acids and bases to maintain our blood pH where it should be as long as you have a balanced diet with lots of fruits, vegetables, and natural foods. On a side note, even though it’s technically safe from an acid point of view to drink soda, sugary drinks like soda should generally be avoided to stay healthy. If you measure your RO water to find that it’s a bit more acidic than you are comfortable with, you can just add a few specks of baking soda and mix it in to increase the pH. Don’t add too much, or else you’ll tip the scales too far to alkaline! Use a remineralization/alkaline stage in your RO system. 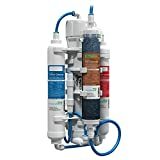 This is another tank that attaches to the last stage of your RO system and it will add some minerals back into the water, raising the pH closer to neutral. You can also use alkaline water pitchers which work on the same principle as a remineralization stage, except instead of in the system itself, it’s now outside so you can control how much water you wish to neutralize and how much you wish to keep as is. 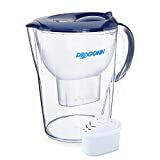 A remineralization stage is a longer term investment and requires less replacing/maintenance than an alkaline water pitcher which may get slightly expensive in the long run. Searching online, watching videos, and hearing things from your friends may have you inclined to think that alkaline water is a miracle drug that cures cancer. However, there is no clear consensus in the scientific community with regards to whether alkaline water is all its proponents claim it to be. On the whole, natural water is the best water you can drink, according to the Mayo Clinic. There have been a few studies that show certain benefits for alkaline water, though. A study in 2012 showed that drinking alkaline water with a pH of greater than 8.8 had an effect in reducing the enzyme that is responsible for acid reflux. Another study suggested possible benefits from alkaline water for people who suffered from high blood pressure, diabetes, and cholesterol. Another study suggested that alkaline water can help in oxygen delivery all over your body by increasing the blood’s viscosity. Please bear in mind that these studies were done with very small sample sizes and the results are far from conclusive. THIS IS NOT MEDICAL ADVICE TO DRINK OR AVOID ALKALINE WATER. CONSULT A DOCTOR IF YOU HAVE ANY DOUBTS! I am not saying that alkaline water does not do this, I am just stating that there is not yet enough conclusive evidence to show that it indeed does. Really the key here is the word this commenter has capitalized: NATURALLY. 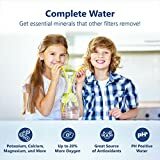 If your primary water source is NATURALLY slightly alkaline and you and your ancestors have been drinking it for generations and living long and healthy lives then sure, it’s good for you! However, attributing long life solely to water is confusion correlation with causation – there are other factors such as diet, stress, and environment which make a much bigger difference than the acidity or alkalinity of your drinking water. Remember, the main purpose of RO water is to REMOVE contaminants – which can cause serious health problems.